California’s green-vehicle subsidies and income inequality. How California’s green-vehicle subsidies magnify the state’s income inequality problem. Subsidizing a rich person’s purchase of a Nissan Leaf isn’t the fastest route to clean air for all. Since 2010 the roughly 38,000 citizens and businesses of this prosperous Bay Area suburb, where the median household income is $140,444, have purchased 463 zero-emissions vehicles. Such vehicles receive major state subsidies; nearly $1 million of these subsidies went to vehicle purchasers in San Ramon. But San Ramon doesn’t need the anti-pollution help. Despite being home to a large highway complex and a business park, the city scores in the cleanest 10 percent of California’s ZIP codes, according to the California EPA’s EnviroScreen index. California’s green-vehicle policies have been successful enough to become models for other states, fueling a movement that is electric, both literally and culturally. The state’s audaciously utopian vision has cajoled an initially reluctant auto industry into producing cheaper, better-behaving electric cars, led by the media-savvy upstart Tesla. 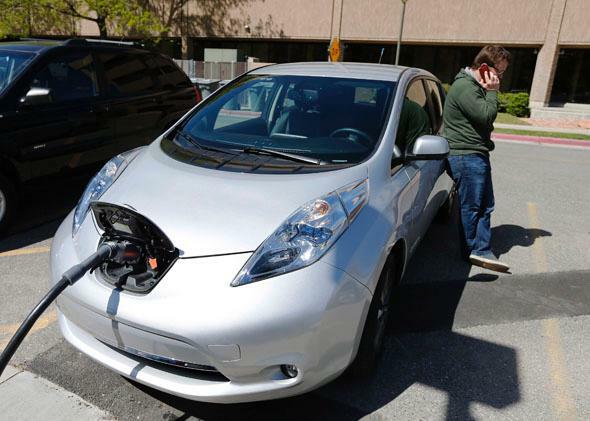 Since 2010, Californians have put more than 100,000 electric vehicles on the road. But those green-vehicle policies contain a flaw that undermines their intent and magnifies the unfairness of California’s economy. These rebates—of as much as $5,000, funded by an extra charge on vehicle registrations—go mostly to affluent communities on California’s coast. Go below the Central Valley’s smog, and the problem runs much deeper: Its cars are old—much older, on average, than the state’s vehicle fleet. Estimates suggest that the median vehicle in poorer Valley communities is from 1996. According to the Air Resources Board, a vehicle made in 1996 produces 29 times as much pollution per mile from its tailpipe as one sold in 2012. Translation: The Central Valley’s stock of old gas guzzlers is wiping out the clean air benefits of the subsidies we’ve bestowed upon the wealthy parts of the state. I am not making this point to advocate the end of the green-vehicle subsidies, but to point out that these subsidies were created to target the state’s wealthy. And they succeeded. up with a new set of policies to target California’s many Mendotas. We need a suite of incentives—low-interest loans, nonprofit auto leasing, and more accessible, appropriate rural transit—to get working families out of older, polluting vehicles and into cleaner transportation (which doesn’t have to be electric). Last year I spoke with a Mendota farmworker who drives a 1995 Ford Explorer. Mr. Hernandez drives twice as far to his skilled job every day—115 miles round-trip—as the average driver of a Nissan Leaf. Last year he had to pay for two smog tests and repairs, totaling about $500, just to keep his car registered. From Mr. Hernandez’s point of view, the car is a money pit, but it’s necessary for him to get himself to work and bring his daughter to high school. (Parents have to drive their kids to school when the Central Valley’s tule fog delays school start times.) Because the car gets only 15 mpg, he spends $400 to $500 a month on gasoline, and often puts off paying other bills to keep getting to work. “Now I own an antique!” he said, throwing up his hands like a man who’s trapped. But he’s not the only one: California’s big green vision will be stuck in neutral until we figure out how to extend its promise to every ZIP code. Future Tense is a partnership of Slate, the New America Foundation, and Arizona State University. This article originally appeared on Zócalo Public Square.